The aerial drone, the government's signature weapon of modern warfare, may be great at hunting down the latest terrorist but its managers could use a lesson in bargain shopping. 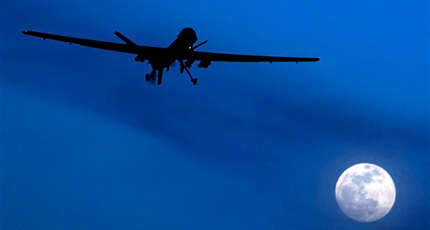 WASHINGTON – The aerial drone, the government’s signature weapon of modern warfare, may be great at hunting down the latest terrorist but its managers could use a lesson in bargain shopping. The government is wasting billions of dollars on its drone programs because military agencies aren’t coordinating their efforts, creating expensive duplications of research, development and parts purchases, congressional and Pentagon auditors have found in separate reviews. For their lack of coordinated efforts and bulk buying power, the government’s drone programs win this week’s Golden Hammer, a weekly distinction awarded by the Washington Guardian to a prominent example of government waste. A Government Accountability Office report to Congress describes one way taxpayers are losing out in the race to man the skies with drones. The Navy is planning to spend $3 billion developing its own variant of the Air Force’s Global Hawk drone. Navy aircraft are often altered to meet special requirements, such as landing on aircraft carriers. But the Navy has been unable to convince auditors why it needs the alterations instead of just using the existing Air Force craft, the GAO found. Nor was a cost analysis done to find how much money could be saved if the Navy just purchased the existing drones. Officially known as Unmanned Aerial Vehicles or Unmanned Aircraft Systems, the drones’ role in combat operations is expanding along with their storied battlefield victories. But unnecessary or duplicative costs in drone programs are an easy target for auditors desperately searching for any saving to federal budgets. That’s because the Pentagon is facing serious budget cuts next year from a deficit reduction deal last summer that is now being called the “sequestration” or “fiscal cliff.” The Defense Department is among the hardest hit in the automatic spending cuts that take effect Jan. 1 if Congress doesn’t intervene. And that has made finding every spare penny — or billion for that matter — all the more important. The cost savings aren’t just limited to the Navy. A 2010 Pentagon-sponsored study concluded taxpayers could have saved $1.2 billion had the Army and Air Force worked together to develop sensors for drones designed to track ground communications. Instead, both branches developed essentially the same technology separately, the report said. And now the Navy has started its own sensor program, even though the planned capabilities are essentially the same as the existing Army and Air Force variants, the study said. The Defense Department didn’t comment on the GAO study, other than providing technical clarifications and information on specific programs. When contacted by the Washington Guardian, a spokesman said the Pentagon had no further response at this time. The potential for waste and duplication in the future is huge. The Pentagon predicts it will spend $37.5 billion on drones over the next four years. The Defense Department’s UAS Task Force encourages cooperation among the branches but has no authority to impose it, the GAO said. And that is bad for the American taxpayer.